The Razorgator eTickets iPhone app purchases tickets to sports, concerts and a huge variety of events with simplicity and security. The intuitive interface incorporates smart features like venue layout, all-inclusive pricing, and e-ticket delivery to your iPhone. The free download from the iTunes App Store securely encrypts your debit or credit card information for swift purchase. The Razorgator eTickets iPhone app requests location services authorization to automatically present you with options. It wisely incorporates broad searches, so selections from nearby, easy road trip locations are also available. The home screen organizes events by date. For each event, there is a thumbnail photo, title, and location. You can also tap the search icon and type specific parameters. To expand the event, you tap the arrow in the far right corner of the screen. The event’s screen is nicely organized and efficient. The name of the event, location, date, and time are listed at the top of the screen. Just below, the layout of the arena or venue is shared. Finally, there is a list of available tickets. For each section and row, you will find the number of tickets available and the all-inclusive price per ticket. When you tap on the list, the section of the venue is highlighted. To purchase the tickets, you create an account with email or Facebook authorization. You must also enter a code sent via SMS text to verify your account. You scan your credit card, then manually enter expiration and certification values. The prompts specifically cite Razorgator’s commitment to your privacy and security. 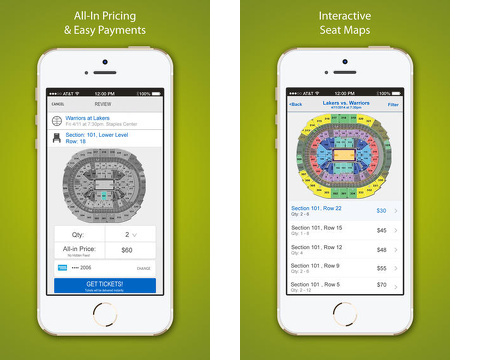 When you purchase a ticket, it is automatically delivered to your iPhone. The line icon in the upper left corner of the screen opens a sliding left menu. You can access your purchased tickets and scan them for entry at the venue. The tickets are also sent to your email address, so you can print them. The e-ticket delivery to your iPhone also encourages spontaneity. If you’re out on a great date for dinner, it would be impressive to whip out your Razorgator eTickets app to buy tickets for a late-night event. As a bonus, last minute purchases may be purchased at a steep discount. 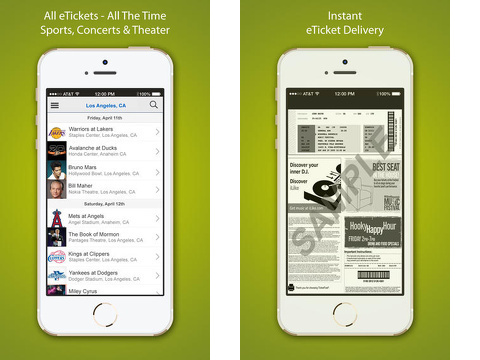 The Razorgator eTickets iPhone app is simple, clean, and sophisticated. It provides all of the tools you need to purchase tickets with confidence and speed. AppSafari review of Razorgator eTickets: Sports, Concert & Theater Events was written by Jenni Ward on April 11th, 2014 and categorized under App Store, Events, Free, Fun, Music, Productivity, Shopping, Sports, Utilities. Page viewed 8615 times, 1 so far today. Need help on using these apps? Please read the Help Page.